Since 1958, Tustin Plumbing, Heating and Air Conditioning has provided expert residential services throughout Orange County. We understand the requirements of our customers and know we need to offer not only the best possible service, but also affordable prices. Our 24-hour emergency service will bring you skilled help when you need it, and at reasonable prices. Some emergencies may be unavoidable, but other times an undetected problem or neglected repair turns a problem that could have been easily handled into much bigger trouble. So we also offer regular maintenance and help in repairing or replacing your plumbing and HVAC systems. Remodeling specialists at Tustin Plumbing, Heating and Air Conditioning also offer expert kitchen and remodeling services. Whether you're planning a minor update or a major renovation, our specialists will listen carefully to your plans and offer the best possible recommendations for your budget and project. 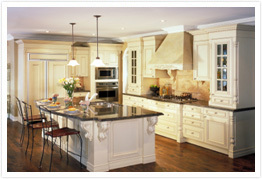 They will work with you in choosing the right materials, colors and design for your kitchen or bathroom remodel. Our guarantee means you will get exactly what you want, within your planned budget.